HELLLLLLO, FRIENDS!! Today we’re back to (hopefully) regularly posting schedule. Those last few weeks in November were rough and left me with no desire to blog. But I did host a few giveaways that I hope you entered! One ends today, one tomorrow, and another in a week or so. So, ENTER! Brilliant haul this week, you’ve gotten your hands on some awesome books. I’m especially excited for My True Love Gave To Me, I can’t wait to read that one :) I hope you enjoy all of your reads this week :) Here’s my STS. There are a lot of books that I’m not familiar with. They all look good. I’m actually making a list of books that I want from your haul. Very nice haul! Tuck Everlasting is one of my favorite books. Enjoy! I got the same books from Edelweiss – can’t wait to start reading. OOOoh nice haul!! And YAY for signed editions!! Those are always a treat!! And ooooh very envious of Crimson Bound, my request is still “pending”…which never leads to a good thing! Though as depressing as each rejection is, it’s a good thing because it will allow me to catch up on my own stack after I finish my current review stack! Ahhh, so many great books here! Cannot wait to see what you think of Crimson Bound, Made You Up, Proof of Forever and Things We Know By Heart! Can’t wait to read those ones. My review request is still “pending”, so I’m not getting my hopes up. 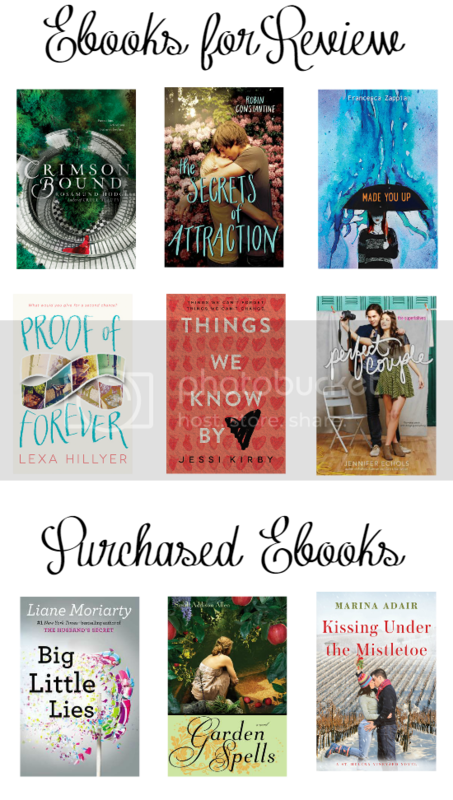 So many pretty reads! Hope things are calming down for yall over there!